Male / Female; Proven experience in a parts and distribution business; Intermediate to advanced skills in the Microsoft Office suite; Computer literate; Electrical and/or Mechanical Engineer background is an advantage; Excellent phone communication skills; Reliability and honesty is important; detail and solutions oriented; Ability to work under pressure with proactive approach. Vocational graduate or at least College level; Basic understanding of electrical, hydraulic and others systems; Working knowledge of tools, common appliances and devices; Manual dexterity and problem-solving skills; Good physical condition and strength with a willingness to work overtime; Effective organizational and interpersonal skills; Strong attention to detail and follow-through skills; Must have the ability to work independently; With experience as an Aircon Technician for at least 6 months to 1 year; Experience in maintenance and installation of different types of air-conditioning (split type, floor mounted, ceiling mounted, wall mounted, ceiling concealed, cassette type, ceiling suspended, air handling unit, centralized, etc.). At least High school graduate; With at least 6 months of call center experience; Good computer navigation skills; Excellent English communication skills; Preferably with sales experience in any industry. Male / Female; Bachelor’s Degree in Business Management / Administration, Hotel and Restaurant, Food and Beverage Services Management or related courses with equivalent experience and trainings; 2 to 5 years of experience in food operations / restaurant industry as supervisor or manager; Knowledge in profit and loss presentation and analysis, restaurant operations, POS system and marketing plans and strategy; Excellent interpersonal and people skills, strong decision-making, problem-solving and mathematical skills and good analytical skills; Responsible, people and service-oriented, honest, result-oriented, effective leader. Male; Physically fit; College level / High school graduate, vocational / Short course certificate; At least 1 year or more experience in Building Maintenance / Handyman; With strong background in mechanical and electrical works; Trustworthy, can start immediately and willing to work as stay-in. Female; At least 5’2” in height; With pleasing personality and good interpersonal skills; At least College level with 1 year experience; Preferably with knowledge in using POS Machine; Customer service oriented; Willing to work Sundays and Holidays and in shifting schedule. Male / Female; At least 5’2” in for Female and 5’4” in height Male; With pleasing personality; College level / High school / Vocational graduate of any course; Related working experience in a restaurant is an advantage; With good communication skills and customer service oriented; Willing to work on shifting schedule. Male; At least high school graduate / College level; With at least 6 months experience as kitchen helper or griller in a restaurant; Willing to work on shifting schedule; With good attitude towards work. Male; College level / High school graduate; At least six(6) months experience as grillman preferably in a restaurant; Willing to work on shifting schedule; With good attitude towards work. 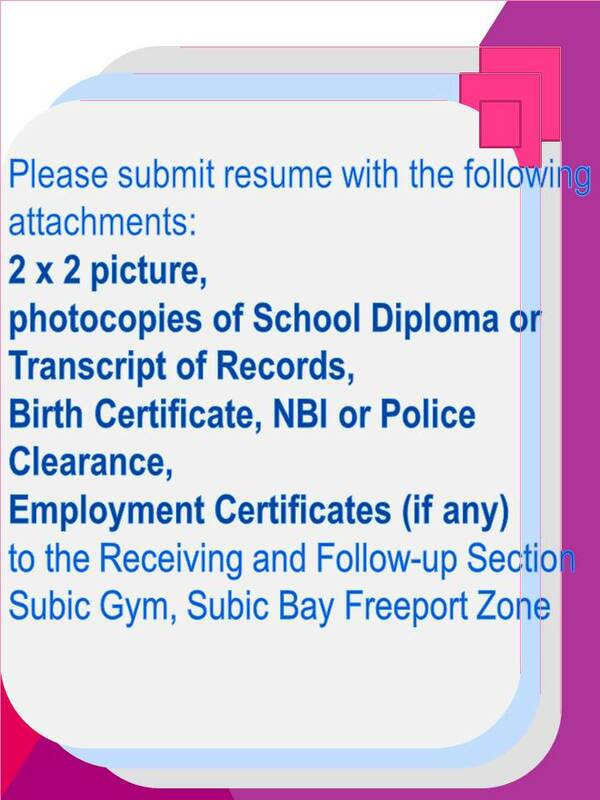 Male; College level/graduate of HRM course or High school Vocational Cookery course with equivalent experience and trainings or with NCII Certificate; At least one(1) year experience as cook preferably Filipino cuisine; Willing to work on shifting schedule; Trustworthy; with good attitude towards work. Male; At least high school graduate or any Technical / Vocational courses; With at least 1 year experience; With NCII certificate / training certificates; With knowledge in civil work steel, stainless and ordinary, sheet metal fabricator, SMAW / argon welder; Must be efficient, with positive working attitude, and can work under pressure. Female; Graduate of Hotel and Restaurant Management or 2 years F & B course; Able to work under pressure, committed to work and willing to work overtime. Candidate must possess a Bachelor’s Degree in Accountancy; Preferably with Accounting background / Bookkeeping; Being organized and methodical; having good math skills; Being trustworthy and honest; Accurate and analytical; Having IT skills; Having interpersonal abilities; Able to learn quickly; Able to solve different conflicting demands. With experience in the food industry (excluding fast food chain). Male; Graduate of Automotive; At least 2 years’ experience in the field; Hardworking; Possess good moral character. Must be College graduate of any Business course; Proficient in speaking English; Goal oriented; Can work under pressure; people oriented.